Our new Create A Bear Parties begin with a chance for your child to create their new best friend in their own home or a private environment with their friends using our mobile parties. We use only highquality animals, clothing, and stuffing. Each bear comes with a backpack to transport them in. 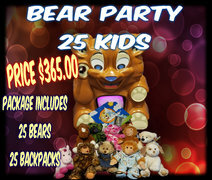 The best part about create a bear parties are that we come to you and do everything for you so you can sit back, relax, and enjoy watching your children light up as they see their new animal come to life. 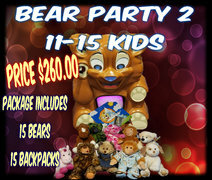 This offers a new opportunity for creating fun and unique home parties and the best part is you do not need party favors as each child will take home an animal of their very own to love and create adventures with. We have a variety of bears and various other animals to choose from. Animals do not come with clothing, but clothing is available for the animals at an additional cost. We do offer packages for bears and clothing as well to save money by packaging them. We will provide a staff member to come to your party and stay for the duration of your party to make the animals with the kids. Please note that we do only stay for 1.5 hours to actually do the bears. Be sure to schedule your bear party for when the kids will actually be at the party not prior to. Each party is 1 and a half hours long. Staff members will arrive 30 minutes prior to party time to setup and be ready for the beginning of your party. 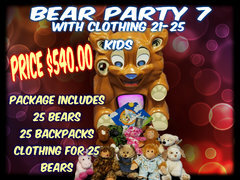 Selecting the correct bear party package you need will depend on the number of kids you have coming to your party. You can add on additional bears for an additional fee if you have extra kids show up. If you need any help scheduling your bear party, please contact us and let us help you with the details. Creating a bear or animal is a fairly new concept and the latest thing in home parties. This type of party provides the children with a party that is different from other parties they attend throughout the year. You no longer have to go to the mall to have a bear making party. With this party, more kids and adults can attend your party. 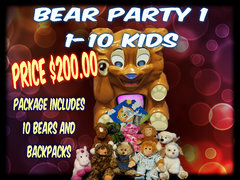 Let Ted help your child to have a Beary good time at your next party or event! Together we can create magical memories that last a lifetime. The Prices listed are to our standard delivery areas; We do service additional areas, those additional delivery prices will be shown in your cart after you enter your zip code.